The publication of Sigismond Thalberg's arrangement of Dafydd y Garreg Wen commemorates the anniversaries of the births of two composers born a century apart. A very near contemporary of John Parry (1710-1782), harpist-composer David Owen was born into the unostentatious background of the Welsh farming community at a farm known as Y Garreg Wen (The White Rock) at Ynyscynhaearn, near Cricieth on the Llyn peninsula. Christened on 27 January 1711, he lived only 29 years, and was buried in Ynyscynhaearn churchyard in August 1741. He is known as the composer of the Welsh Airs Difyrrwch Gwyr Cricieth (The Delight of the Men of Cricieth) and Codiad yr Ehedydd (The Rising of the Lark), as well as Dafydd y Garreg Wen (David of the White Rock). Romantic legend relates that as he lay on his deathbed he called for his harp and played this lovely melody one last time. Sigismond Thalberg was born in Pâquis, near Geneva, Switzerland just over one hundred years later, on 8 January 1812. Mystery always surrounded his birth, but recent research has established that although he was the illegitimate son of a Prince and a Baroness, he nonetheless received a privileged upbringing. Brilliantly gifted, he became known as a virtuoso pianist at a very early age and had an illustrious career over a period of 40 years, during much of which he was considered the arch-rival of his near-contemporary Franz Liszt (1811-1886 ). Their styles, however, were very different, and although at one stage in his career Thalberg was affectionately known as 'Old Arpeggio', the real justification for his virtuosity was his lifelong celebration of melody. Thalberg is reported as having had a fine baritone voice, and to have studied singing with Manuel Garcia for five years. His father-in-law was the famous bass, Luigi Lablache, and he numbered many famous singers and opera composers among his friends. On one occasion, Rossini, after hearing him play one of his piano arrangements of songs at one of his Parisian soirees, told the friends gathered there that “Thalberg has just given you a singing lesson such as you have never had before”. His L'Art du Chant appliqué au piano (The Art of Song applied to the piano) op.70 appeared in four series published between 1853 and 1863. 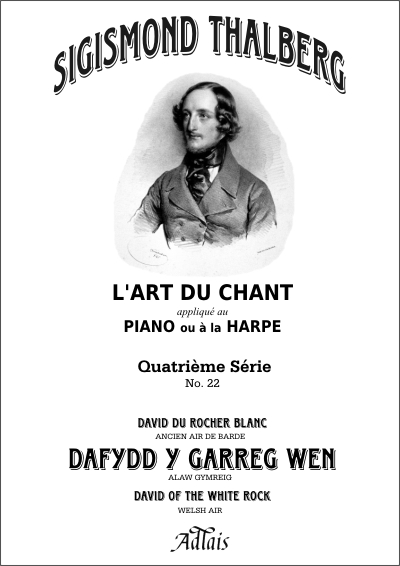 Dafydd y Garrey [sic] Wen (translated as David sur le Rocher Blanc, and called Ancien Air de Barde) was included in the final series and published as no.22 of the 24 published numbers. 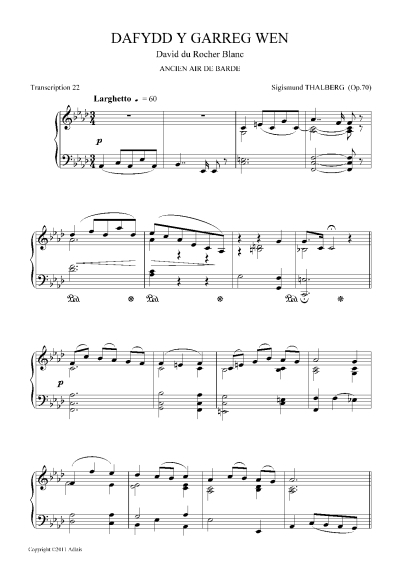 Apart from no.23, a Neapolitan song entitled Feneste Vascia, it is the only folksong in the whole collection; otherwise all the arrangements are based on vocal music by classical composers, mostly operatic, but also including Beethoven's Adelaide and the Lacrymosa from Mozart's Requiem. 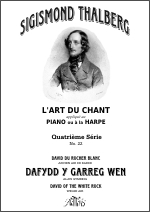 Although it was intended as one of the collection of arrangements for his own personal use as a pianist and which he used extensively on his American tours of 1856-58, Thalberg's lovely arrangement of Dafydd y Garreg Wen is equally playable on the harp and makes a beautiful new addition to the repertoire.